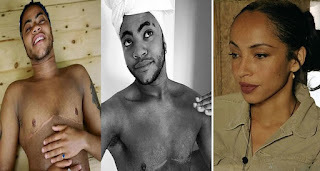 The only known child of Sade Adu, a Nigerian-British singer, Izaak wrote on his Instagram few months back, revealed that he underwent surgery recently, and is now able to wear the male designer shirts he had previously left hanging in his wardrobe. “So many tops I can wear now that I couldn’t before my surgery so happs!! Plus copped this piece,” he said in the post, posing in a Raph Lauren shirt.